Canada is Wide Open for immigrants. But, are you eligible? - Gateway to Canada | Canada Immigration Consultancy! 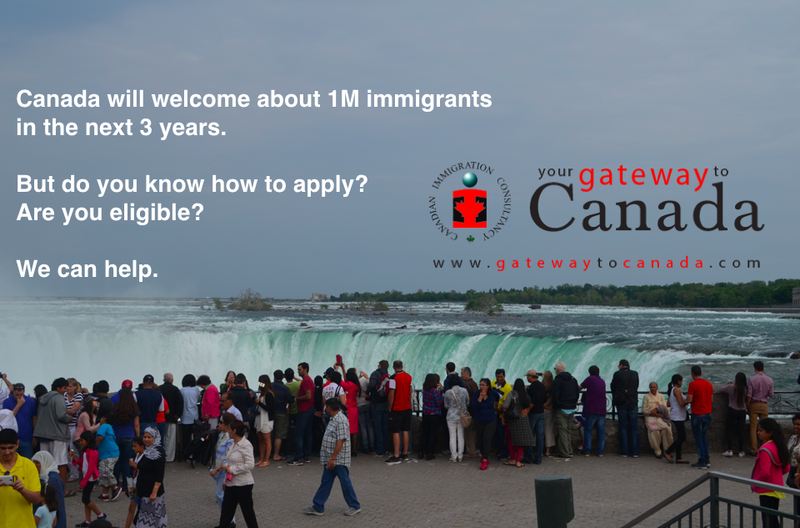 Canada is Wide Open for immigrants. But, are you eligible? Canada is planning to admit nearly 1 million immigrants over the next 3 years. It's all over the news and in social media. The question now is, how to apply? There are various pathways for you to become a permanent resident of Canada. Which one is best for you? Information about Visa Application to Canada is available for free at Canada's official immigration website: http://cic.gc.ca. It is not required to hire the services of immigration consultants and lawyers. But if you are planning to seek an assistance, deal only with Authorized Representatives. The most basic way how to apply for permanent residence in Canada is via the Express Entry System. If you have connection in Canada (Job Offer, Family Member, Relative), Provincial Nominee Program may be for you. Studying in Canada may also lead you to permanent residency. But be very careful, do not be a victim of education trafficking. If you have a job offer from a Canadian employer, you may enter Canada as a Temporary Foreign Worker. The challenge, however, is how to find one. Avoid unregistered immigration consulting firms who are promising you a job. Here's how to find jobs in Canada. Intersted to immigrate to Canada but don't know where and how to start? Take our FREE Online Assessment.